I suggest you ask your clients how you can help them get into the window of tolerance. They might not all be able to give you suggestions, but many of them can — and their suggestions might also be helpful for other clients. But be sure to remember your clients’ right to informed consent when trying any strategy They might be able to tell you that a strategy doesn’t work for them, or might be able to suggest how to modify it to be helpful for them. Thank you Trudy for your useful suggestion, it makes perfect sense. This is a fantastic resource, thank you for sharing! I am just wondering if it might be available in Spanish and/or if anyone knows of a similar graphic in Spanish. First reaction: This is a good idea! Second reaction: But it’s just saying the obvious (from my client perspective), so it could be patronizing for the therapist to introduce it to the client as a way of “explaining” something. Fourth reaction: But I find it hard to imagine any of the therapists I’ve tried adopting this graphic. One problem I’ve found repeatedly with therapists is that I think in “shades of gray”, while they seem to think in “black and white” terms. And I’m very visually/spatially oriented in my thinking, whereas therapists so often seem to be not just “word-bound” but often “label-bound”. But the graphic requires both the “shades of gray” and “visual/spatial” types of thinking. 1. This graphic can be a good “tool” for communication in therapy– but the therapist needs to be willing and able to use (or at least respect) the “shades of gray” and visual/spatial thinking that the tool requires. 2. So for some (maybe even many?) therapists, teaching the therapist to respect and use these types of thinking needs to be an important part of their training. Please advise how to sign up to listen live. i have been using this info for a few weeks. People take a great deal from the image and the separation of hypo and hyper -aroused. They identify quickly the types of situations that put them in a different reaction. I look forward to what this awareness will contribute to managing reactions. This is terrific. I have client that will really be able to use this graphic. Thank you for all your work and being willing to share it with us. You and your work are much appreciated. Thanks for this tool. I’m looking forward to sharing and discussing it with a couple of people I work with. Pretty sure they’ll find visualisng the metaphor very useful. Shout-out to Sue Sibbald (‪@BPDFFS ‬on Twitter) for sharing it. I have not been opening your emails, WOW, have I missed out!!! Thanks or all you provide. I have a client, 13 y/o, he’s been in/out of hospitals, residential. This graph will be helpful to explain to him his outbursts and where I am trying to guide him. I’m not sure this is completely accurate. If someone has a wide window of tolerance, they can experience high levels of arousal which are not experienced as too much. Lenora, exactly. Each person’s window is unique to them. Trauma counsellors help people learn to widen their window of tolerance, so they are not as often overwhelmed or shut down. Someone with a wide window of tolerance probably doesn’t need trauma counselling. That sounds to me like saying functioning alcoholics don’t necessarily need recovery. There is still going to be extreme pain even if there is a huge window of tolerance with symptoms. I think I’ve spread mine out to be able to function very well during hypo and hyper arousal. I am fully functioning in both cases. All this coming from disillusionment with what is deemed socially acceptable behavior, so I’m trying to take me with a grain of salt. Don’t worry, going to counseling tomorrow. This is absolutely wonderful. I really can use such a tool. Whoever put this together is talented. Thank you. Many thanks for dong this. I had conducted a search to find a similar model, online. This one serves the purpose very well. Very much useful for my clinical work! Thank you so much for sharing this wonderful, well thought out and helpful material. I also printed out last week’s helpful tool that you offered and have found time to watch two of your video presentations. I really appreciate you making this material free for those of us on low incomes it is a great resource and so generous of all of those involved. I am in my first few years of practice, I love my work. I have traveled a long and complex road myself and enjoy assisting others on the journey to a better experience of life as they become self aware. Regretfully during the broadcast my pregnant daughter called me having lost her window of tolerance with a baby already overdue 1 1/2 weeks. So i dissociated into the strong, coaching mother high soul functioning part to return her to a state of balance. But then i forgot the last broadcastreplay. Guess my brain still somehow offline. Thinking about it outside whilst walking my dogs, then when home completely lost the info until the end of the broadcast. Tks for the infographics. What i miss under the FREEZE/hypoarousal is the feeling of not existing at all and the body completely shutting down, unable to breath, yet somehow whilst choking and suffocating there still is this soul that will not let me die and after a difficult struggle breathing returns. The not existing feels extremely scary. Possibly this link between soul and body can be severed. Laurence Heller describes my kind of trauma, where people remain in the dimension of the soul and do not incarnate as babies. Having made the choice to do so, i miss all the clear abilities i used to have and am not there yet to be comfortably incarnated. The extreme dissociating was too taxing on my physical health. That said looking at my soon to be a mother daughter, i can see i did things right despite. This is the best time to get this info. My family gathering during the Holidays have been quite aweful most of the time. Exposure to stressful relationship is something I can be quite antsy about. My down time is when I shut down and go into the hypo- mode. No good coping skills for now, just space for myself as isolating to put things in perspective . The results are very mild to some kind of effective. It is hard to get into the window zone and have a good time. Thank you so much for these wonderful tools and aides to help us in the work we do with our clients! I am so appreciative of your work and your commitment to helping clinicians become better at what they do, in order to improve the lives of our clients. Beautifully done. Wish I’d had this before I retired. My rendition on the White Board was so humble—but it still was a huge benefit for clients to learn about how our reaction tendencies were formed by experiences (therefore one is not intrinsically flawed) and reaction tendencies can be altered by new, appropriate experiences. (Many still believe the myth that one is stuck with tendencies formed before the age of 5). In the absence of conscious awareness, “one IS stuck with tendencies formed” by age six. Fortunately, we don’t have to stay “stuck”. Due to trauma from my childhood the effects have been a roller coaster of emotions. I still get flashbacks of sexual abuse from my brother and father. How due you you deal with them in a healthy way? Thank you so much Ruth. I am already identifying clients I can use this with. I do appreciate the many things you share with us especially the recent video series. Thank you for this handout. I think it will be helpful as I work with clients. It also helps illustrate what was in the video for this week. Really enjoying the series and this week’s presentation was the best yet. Thank you! What is in your toolkit, if you don’t mint sharing. Thanks for this graphic. A helpful resource that would also be great in a public education campaign. So many have no idea that they can learn how to manage their own window of tolerance and that will reduce stress and expand the capacity to respond rather than react. My personal experience in therapy was that therapists wanted to be in charge of this concept. They missed the mark so many times. Re-traumatizing could have been avoided or repaired more easily if we had worked together to understand and work with my window of tolerance. 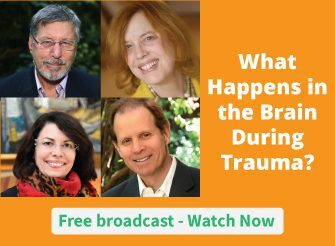 The trauma master series also is a terrific resource for life coaches like me to better recognize and communicate the life coaching process and its difference from therapy. Perhaps this can be added to the master class. Thank you! I have a sheet I developed for this which is similar but not nearly as pleasing to the eye! This program is amazing to watch but the infographics will be very helpful in the future as well. As someone who experiences hypoarousal, it’s helpful to read the line, it’s not something you choose – your body takes over. From this chart and the video yesterday, I see now that one way to help my recovery is to pay attention to the early signs of getting sleepy and instead of closing my eyes for a bit, get up and move around, do a chore, etc. Then I can come back and see what the trigger was. Very helpful. I am going to list this as my tool. Thanks. What a wonderful tool! Thank you for your generosity! You continue to inspire me with your generosity. Thank you. As someone who who has had PTSD for 50+ years, it is a blessing to have these wonderful people and this organization help me to understand my issues. In the early 60s and decades following that, this information was not available. You have helped me so much and I thank you, thank you, thank you. I love this. As a client I find it very reassuring to see that what feels like a chaotic inner experience has a pattern and order to it. I’m less scared of what happens to me. Thank you! I can use this with my patients. Very useful information. Thank you for your gathering experts together for your trainings. Thank you for the visual aids. Thank you for the work you do. The results that I am seeing in myself are incredible. I had my jugular veins opened in 2011 (CCSVI treatment for Multiple Sclerosis. 50% stenosed either side). It took about 2 years for the flashbacks to become completely disabling. ( I had survived the sexual abuse that started from age 6 or 7, (Dads best friend). Being stalked for several years. And everytime I would go for treatment I would be victimized all over again. With the help of a Functional Medicine Doctor I have been given the tools to help myself. These include neurofeedback, an introduction to The Body Keeps The Score, accupressure, yoga, talk therapy, rescuing my self as a child, 432 hrz music, hypnosis, etc… My therapist felt that I would benefit from NICABM as I only get to meet with her once a month. I would like to sign up as a Gold Member, unfortunately I have no support from family or friends and being disabled I live on very limited funds. Once again thank you for sharing. I understand what you are teaching from a trauma patients point of view and want to share it with the world. THERE IS HOPE FOR US, AS I AM PROVING TO MYSELF WITH EVERYONES HELP. Love and Light to you all. a simple way to help folks understand what is going on—why they are finding things harder than before, and there’s a way to stretch it tolerance out again—not completely but effectively. It is not just the left. Have you seen the Raging Right ? Yes, I’ve seen images of the Raging Right. Way way way smaller than the raging Left, from my extensive attention to this. Also, in my extensive experience as well as attention, those you call the right are often the Reasonable – using logic, facts. Here is one experience. I was one of about 50 people who went to a Freedom of Speech event. Easy-going people, maybe 50 of us – most also older. I’d say the average age was about 60. I got there an hour early. About 300 angry slogan-shouting Raging Left (Communist, in large part) people were already there, many very young. (I’m not saying any age group is better or worse – but the age difference was noteworthy.) A few of the Freedom of Speech people went to the slogan-shouters, tried to talk. Rage. A few attacks (them to the Freedom of Speech people) if they were able to get past the police holding them back from attacking. There were already at least 30 police officers keeping the Raging Left people from attacking (not always successfully). Soon there were another 50 riot police in full gear holding back the Raging Left people. What did we do? Well, it started with singing Oh Canada. This is the second time I’ve witnessed something similar. The first time a friend and I went to an event we had heard of. Again, several hundred slogan-changers – and loads upon loads of riot police to protect people from the slogan chanters. In that case, the group holding the event did not show up. If you like, I can send you a full account. It is on my blog, including photos. And there’s a video of the first event I mentioned. I can see if I could dig that up. a lovely tool, thank you so much! great explanatory image, thank you. 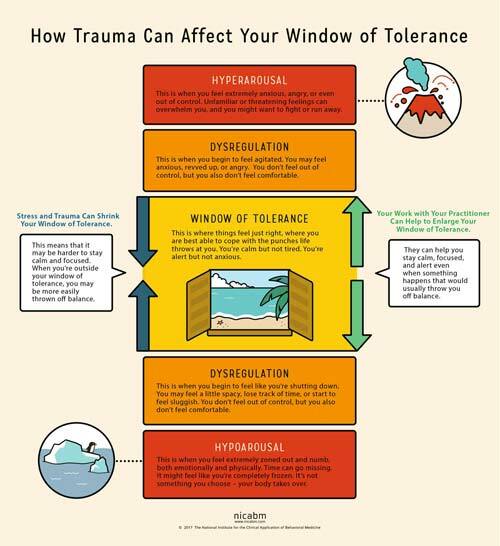 What a helpful informative diagram to explain the range of Window of tolerance towards hyper and hypoarousal, highlighting importance of observation of Therapist to support the client and the pace for their recovery. This is a nice infographic and interesting theoretical concepts but how do you enlarge the window of tolerance? It would be great to see the peer reviewed research behind this. I’m not sure of how this is done by engaging with a Counsellor, however personally, I believe the way to expand the window of tolerance is to firstly become aware of how tolerant you are, what triggers the intolerance and what you are tolerant of. Each of us will bear things to different degrees, based on our own experiences etc. Once you have awareness – then it is a matter of creating situations where you can expand your levels. This may mean bringing things into your comfort zone area slowly at first until you feel less threatened or worried about them. Everyone has a stress level limit and its about gently and with awareness increasing what you can accomplish. Make it fun, put yourself in situations where you actually are tolerant and increase those things, as well as becoming aware of what you aren’t tolerant of and gain experience and knowledge about why you arent. I believe it was Dan Siegel who developed the Window of Tolerance. You can find out more info in his book: Siegel DJ (1999) The Developing Mind. New York: Guilford. Really useful infographic and a great teaching tool.